An accurate, short, sophisticated and cheap method is described that assesses telomere length in multiple tissues and species using qRT-PCR. In addition, we will describe a simple assay to assess telomerase activity as a complementary backbone test for telomere length. Axelrad, M. D., Budagov, T., Atzmon, G. Telomere Length and Telomerase Activity; A Yin and Yang of Cell Senescence. J. Vis. Exp. (75), e50246, doi:10.3791/50246 (2013). Telomeres are repeating DNA sequences at the tip ends of the chromosomes that are diverse in length and in humans can reach a length of 15,000 base pairs. The telomere serves as a bioprotective mechanism of chromosome attrition at each cell division. At a certain length, telomeres become too short to allow replication, a process that may lead to chromosome instability or cell death. Telomere length is regulated by two opposing mechanisms: attrition and elongation. Attrition occurs as each cell divides. In contrast, elongation is partially modulated by the enzyme telomerase, which adds repeating sequences to the ends of the chromosomes. In this way, telomerase could possibly reverse an aging mechanism and rejuvenates cell viability. These are crucial elements in maintaining cell life and are used to assess cellular aging. In this manuscript we will describe an accurate, short, sophisticated and cheap method to assess telomere length in multiple tissues and species. This method takes advantage of two key elements, the tandem repeat of the telomere sequence and the sensitivity of the qRT-PCR to detect differential copy numbers of tested samples. In addition, we will describe a simple assay to assess telomerase activity as a complementary backbone test for telomere length. Telomeres are repeating DNA hexamer (TTAGGG) sequences found at the ends of chromosomes. In each cell replication, these chromosome ends are shortened. If they become too short, chromosomes can undergo telomere end fusions, aberrant recombination, and degradation. Thus sufficient telomere length maintenance plays a major role in chromosome stability and cell protection 38. Telomere length maintenance is also crucial for genes found near the ends of chromosomes, since DNA replication cannot continue to the very end of chromosomes 1-2. Consequently, prevention of telomere shortening may improve cell stability. Numerous studies have reported that telomere length is correlated with an organism's longevity and diseased state, such as in cancer 3-4, diabetes 5, and cardiovascular disease 6,7. Additionally, shortened telomeres have been associated with excessive stress or an unhealthy lifestyle 8, perhaps by promoting premature cell aging and death 9. On the other hand, some studies have found that there is no significant difference between telomere length and longevity and age related disease 39, 40, 41. One of the cell's innate mechanisms of protection from telomere shortening is by activating its own enzyme telomerase reverse transcriptase (TERT). This enzyme and its subunit, telomerase RNA (TERC), a non-coding RNA, use the telomere as a template to add telomere repeats to chromosome ends 10. Although telomerase activity is absent from several types of cells and other mechanisms are involved in telomere length maintenance, increased telomerase activity is correlated with increased telomere length. Telomerase activation has been established as one of the mechanisms by which cells respond to damage and stress and avoid premature senescence and death. For example, longer telomeres were demonstrated in a population of Ashkenazi Jews with exceptional lifespan 11, mutations in TERC or TERT have been shown to contribute to fatal disease 12, and epigenetic regulation of telomerase has been shown to have an effect on age-related disease 13. Since its discovery, telomere length has been proposed as a biomarker for health status in various animal models as well as in humans, but these early studies were difficult to widely replicate because the method used was tedious, long and expensive. In 2002 and further tuned in 2009, Cawthon proposed and demonstrated a new, accurate, fast and simple PCR based protocol to assess telomere length and further investigate its role in various aspects of cell biology, aging and disease 19. Choosing the correct telomere measuring method for a study is essential. Currently, there are various methods used to measure telomere length, each with its own advantages and disadvantages. Traditionally, telomere length is measured using Southern Blot analysis of terminal restriction fragments (TRFs), which involves: a. digesting the DNA with restriction enzymes that do not cut in telomere repeats in order to obtain TRFs, b. Southern Blot of these TRFs is done by determining the mean TRF length using a telomeric probe 14, 37. Although this method is highly accurate with a small coefficient of variation, is a direct measure, and can be advantageous for measuring length distribution, TRF analysis is costly, labor intensive and requires at least 3 μg of DNA. This method is also insensitive to short telomeres and length determination can be confounded by subtelomeric DNA, which can be detected by the probe due the (TTAGGG)n like sequences they contain 15, 42. Another highly accurate method in measuring telomere length is Single Telomere Elongation Length Analysis (STELA), a single molecule PCR based method that only requires a small amount of DNA. In this method, primers are made to recognize the G-rich overhang at the end of chromosomes and to bind to a unique subtelomeric sequence on one chromosome, which amplifies the telomere of a specific chromosome. The resulting amplification is then visualized by Southern Blot. This method has the advantage of being highly accurate and is able to detect short outlier telomeres 16. Unfortunately, since not all chromosomes have G-rich ends and a usable subtelomeric sequence, telomere length can only be measured on specific chromosomes and these measurements may not represent the length of all the telomeres in the cell 15. Another method that has been practiced is the use of Peptide Nucleic Acid (PNA) probes to detect telomere length. Quantitative Florescence in situ Hybridization (Q-FISH) allows us to visualize telomeres during metaphase, where the staining of telomeres with a PNA probe in proportion to their size permits the comparison of telomeres between specific chromosomes. Although this method can also be used for cells in interphase, here the telomere length for distinct chromosomes cannot be detected, which introduces a limitation when measuring telomere length in senescent or infrequently dividing cells 17. Flow FISH instead uses flow cytometry and is currently the most sensitive method for measuring telomere length of blood cells in the clinical setting, but requires highly skilled technicians 18. Currently, the standard method for measuring average telomere length in our lab takes advantage of the precision, sensitivity, and ease of quantitative real-time PCR. This method was made possible for measuring telomere length by the development of novel primers that avoid the synthesis of primer dimer-derived products, which would have otherwise been produced in a standard assay due to the repeating nature of telomeres. For this assay, the measurement of telomere length is represented by the T/S ratio, the telomere repeat copy number to single-copy gene number. Since there is a direct proportional relationship between the telomere length and the number of labeled telomere primers binding to the DNA during the beginning stages of PCR, the T/S ratio is directly proportional to telomere length. The T/S ratio is measured by comparing the difference in Ct, the fractional cycle number at which the sample's accumulated florescence crosses a threshold that is several standard deviations above the baseline florescence, between samples with telomere primers and SCG primers 19. This method has been criticized for its indirect measurement of telomere length, which can lead to inaccurate measurements, for example, in the case of chromosome duplications or copy number variations 15. Also, comparison between studies is often difficult, but standard oligomers have been developed to measure absolute telomere length 20. This method was furthered improved upon by Cawthon, using a monochrome multiplex qPCR assay. In this assay, the PCR was run at lower temperatures for the first few cycles to avoid primer-dimer binding and the telomere and control gene were analyzed in the same PCR tube to further avoid error. The resulting telomere length measurements strongly correlated with telomere length measured by Southern blot analysis of TRFs and had higher accuracy 15, 19, 36. At the moment, qRT-PCR is the only convenient method available for testing large sample sizes and only requires a small amount of DNA to carry out. A crucial part of this method is comprehensive quality control measures, so that when it's done properly, this method can provide valuable comparative information about telomere length. Additionally, this method had been adapted for use beyond leukocytes for measuring telomere length in a variety of different tissues 42. Additionally, in order to further understand the biology behind telomere length maintenance and interactions between the two opposing effects (i.e. telomere shortening during replication and elongation by the telomerase enzyme), we accompanied the telomere length method with an additional assay that measures telomerase activity. For this purpose, we used a Telomeric Repeat Amplification Protocol, an in vitro assay. Briefly, lysed, preserved, enzymatically active cells synthesized telomeric repeats onto an oligonucleotide substrate using telomerase, and the products were amplified using PCR in the presence of SYBR Green. The results were then analyzed by comparing sample and control Ct threshold values. Since telomerase is a heat-sensitive enzyme, an additional heat treated control is run alongside each sample 21. While measuring telomere length can provide valuable insight into the possible role of telomere length in the pathophysiology of aging and disease, telomere length is not a static property and more information is needed to understand telomere function. Telomerase activity studies can add information about telomere length regulation mechanisms. For example, the controlled activation of telomerase can maintain telomere length and cell proliferation, but the uncontrolled activation of telomerase can result in cancer. These two inexpensive and straight forward methods combined provided us not only with stronger evidence towards a relationship between telomere length and cell stability, but also further insight into the possible mechanisms of telomere shortening and recovery. With these methods we hope to further elucidate the cell's response to aging and various states of cell proliferation with the ultimate goal of a better understanding of the central mechanisms of cell biology. Most DNA isolation methods may be used. Our Lab prefers Qiagen DNeasy Kit (#69506) for blood sources. Depending on the source of DNA, such as buccal or other sources, a different isolation method may be used. All primers are diluted to a stock concentration of 100pmoles/μl in PCR grade water and stored at -20 °C until required. Working stocks of primers are made fresh and are stored at 20 °C for a short period of time (A few months.) Standard primers were used for telomeres and β-Globin, the SCG, as described in O'Callaghan et al. 20. Note: Primers are diluted to a working concentration of 10pmoles/μl, prior to adding to reaction mix. Serial dilutions of genomic DNA for Telo and Single Copy Gene (SCG) are created to generate a standard Ct value curve for the assay. The genomic DNA used was extracted from lymphocytes from blood samples. These dilutions are created by diluting DNA with PCR grade H20 to each concentration by a factor of 1.68 to yield the two sets of serial dilutions using the same genomic DNA. The starting concentrations have been optimized based on trial and error and may need to be adjusted when using different reagents, instruments, DNA from other species, cell types, and SCG used. Note: Serial dilution using genomic DNA are made by mixing gently and waiting at least 15 min to one hour before taking DNA for the next dilution. Each dilution requires time for genomic DNA to dissociate. For long term storage, aliquot serial dilutions into PCR strips for storage at -80 °C. Each PCR strip is thawed and used once to avoid freeze thaw cycles that may damage DNA. Dilute test DNA samples to a final concentration of 10 ng/μl. We test concentration using Nanodrop or Qubit. We further dilute the DNA from 10ng/μl to final 5ng/μl. We do not test concentration again. Note: Master Mix is made without DNA and with an excess of 5% to 10%. Both Telo and SCG are run together on the same plate using the following program. To test for precision, at least three replicates of each sample and control should be run. Variations in the primers used may affect the results. Our protocol has been optimized to work as follows on the Roche480 Light Cycler and our primers. Wash once with 1x PBS. Resuspend the cell pellet in 200 μl of 1 x Lysis Buffer for every 105-106 cells or 40-100 mg of tissue. Spin down the sample at 12,000 x g for 30 min at 4 °C. Transfer 160 μl of the supernatant into a fresh tube and determine protein concentration. Aliquot and quick-freeze the remaining extract on dry ice/ethanol, store at -80 °C. *In this condition, telomerase in frozen cells or tissues is stable for at least a year. When thawed for use, resuspend the cells immediately in 1 x Lysis Buffer. Heat inactivation control: For each sample, heat treat an additional control extract by incubating at 85 °C for 10 min prior to telomerase activity assay. Standard curve for TSR control template: Perform Quantitative Real-Time PCR using dilutions of TSR, an oligonucleotide with a similar sequence to telomere primers included with the kit to generate a standard curve. Perform the telomerase detection standard assay using 1 μl of each TSR dilution, including the stock concentration. These dilutions can be stored at 4 °C for at least 2 weeks. Place PCR tubes in the thermal cycler and start the cycling program. Collect the threshold cycle or CT value after cycles finish. The threshold cycle is the cycle at which a statistically significant increase of ΔRn is first detected. Generate a standard curve using the CT readings and compare telomerase activity. An example of a telomere length qRT-PCR assay is shown in Figure 1. On the top left panel, samples labeled in red and green represent the location of the tested subjects on the 96-well plate. On the top right panel, the amplification curve is demonstrated. Each subject is tested by two assays (Telomere and Single Copy Gene), which is done in triplicates. Due to different DNA copy numbers produced in the two assays of selected individuals, the number of cycles until the florescence detection reaches its exponential curve differs between assays. In higher copy number tubes (i.e. Telomere assay), the amount of fluorescence detection reaches its exponential curve after 27 cycles. The second set of lines represents the Single Copy Gene (SCG) that has only one copy in the genome, and thus has much less copies than the telomere samples and reaches its exponential curve only after 31 cycles. The brown lines represent the standard curve that is based on a serial dilution of known sample concentrations. The bottom right panel represents the log concentration of the standard curve points (a straight line demonstrates an optimal serial dilution). This linear curve is being used to calculate the concentration of the tested tubes (bottom left panel). The qRT-PCR results, initially in Cawthon's hands 19, and repeated by us and others, have been shown to be correlated with those obtained by the terminal restriction fragment length assay. One T/S ratio unit (qRT-PCR cycles of the telomere run over qRT-PCR cycles of the SCG run) is equivalent to a mean telomere length of 4,270bp in leukocytes 42. Dividing the qRT-PCR cycles for the Telomere assay by the SCG assay in our example resulted in a ratio of 0.87, which is equivalent to an average of 3,715bp. This measurement consists of the telomere length alone and does not include subtelomeric regions. The qRT-PCR demonstrated here involved very little sample preparation. In this example (Figure 1), qualitative as well as quantitative differences (represented by the serial dilution and the concordance between the triplicates) were observed between the two assays. The results calculated from this test show intermediate telomere length for a 65 year old subject. An example of telomerase activity assay results and the possible relationship between telomerase activity and telomere length is demonstrated by Figure 2. Our preliminary results show that a longer telomere length may be associated with increased telomerase activity. Figure 1. Figure 1 represents the typical output from a qRT-PCR assay for Telomere length. The upper left corner shows the samples arranged in a 96-well plate, in triplicate. The lower left corner lists the calculated concentrations and CT values for each sample, which are used to calculate the T/S values. The upper right is a graph of the amplification curve (number of cycles versus the florescence detected from CYBR green), used to visualize the results. On the bottom right, the standard curve for the Log concentration versus CT value of the serial dilution control is graphed. A straight line confirms that the serial dilution was accurately measured and loaded. Click here to view larger figure. Figure 2. 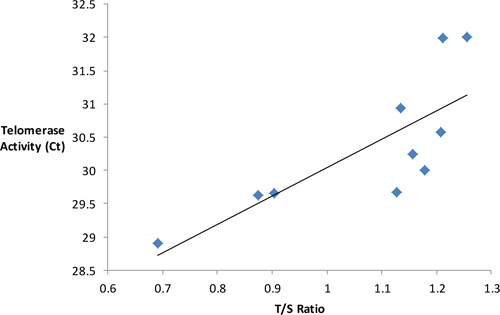 Using preliminary results from the qRT-PCR assay for telomerase activity and telomerase length, Figure 2 shows a direct, significant relationship (p = 0.008) between the telomere length, measured by T/S ratio, and telomerase activity, measured by Ct value. Telomere length provides a unique cellular marker to study the stressed and aging cell and offers insights into the mechanisms of aging. Since its role in aging had first been suggested, a multitude of studies have been done relating telomere length to age, longevity, age-related disease, cancers, and stress. For decades, the gold standard of telomere length measurements was terminal restriction fragment analysis using Southern hybridization. However, recently an affordable, quick, and easy to perform method by Cawthon has evolved. Using Quantitative Real-Time PCR, Cawthon offered a useful alternative to measure telomere length, making studies for large sample sizes possible. Using qRT-PCR, many studies have been done to investigate the relationship between telomere length and a variety of outcomes, especially age-related diseases. More specifically, this method has allowed researchers to perform large epidemiological studies on populations that demonstrate or deny a correlation between telomere length and a variety of diseases. To name a few, ischemic heart disease 7, Alzheimer's Disease 22, osteocarcoma in females 23, lung cancer among smokers 24, familial thyroid cancer 25, diabetes 5, blood pressure 26, aging 27, and dementia 28 have been correlated with shorter telomere length, while age-related macular degeneration 7, colorectal cancer 43, and death from infectious disease, cancer, cardiac or cerebrovascular disease 44 have been shown to have no significant relationship with telomere length . Additionally, certain stresses have been shown to coincide with shorter telomere length, for example, an increased amount of inflammatory markers, TNF-α and IL-6, have been correlated with shorter telomere lengths in leukocytes 29. Also, stressful lifestyles due to time consuming work schedules, shift work, or the nature of the work, in particular a caretaker position for a chronically ill child, have been associated with differences in telomere length. This suggests that stress could cause premature aging by way of telomere shortening without sufficient recovery 30, 31. In a recent study, having fewer social relationships is also associated with shorter telomeres 32. Prevention of telomere length shortening has also been shown to correlate with healthy life choices, such as taking a daily multivitamin and not smoking 24, 33. Additionally, these studies revealed possible clinical uses for measuring telomeres, for example, as a non-invasive screening test for the possible development of cirrhosis 34. In other cases, where similar studies have shown no significant correlation (or a modest correlation) between a disease and telomere length, researchers have been encouraged to study other novel mechanisms for cellular decline and the diseased state7. These studies have strength in numbers and have demonstrated the utility of measuring telomere length as one of the first steps in deciphering the aging process. Cawthon's qRT-PCR method was useful for this purpose because it can compare large numbers of people, requires minimal DNA, and can give reliable evidence towards a relationship between telomere length and cell health. These studies help to steer future aging research efforts to certain genes, tissues, and cellular processes. Inevitably, after a significant difference in telomere length is noted, an explanation is queried. To answers these questions, studies on telomerase, the enzyme involved in telomere maintenance and its regulation, have been established. PCR based telomerase activity protocols have been offered, giving additional information towards: a. determining the contributions of the degradation of telomeres, and b. failure of successful telomere length maintenance by telomerase, thus providing another chapter to the story on aging as a whole, in particular cell senescence. Although qRT-PCR detects average telomere length, and not on an individual chromosome basis, this method is a powerful tool for evidence towards how the cell reacts to aging and stress and provides a preamble to the story of how we age. Interestingly, this information has already led to telomere length measurement in the clinic for estimating biological age and will further our understanding of the aging process and inevitably lead to prevention or delay and screening of aging and age-related disease. Blackburn, E. H. Structure and Function of Telomeres. Nature. 350, (6319), 569-573 (1991). Gilson, E., Ségal-Bendirdjian, E. The Telomere Story or the Triumph of an Open-Minded. Research. Biochimie. 92, (4), 321-326 (2010). Wu, X., Amos, C. I., Zhu, Y., Zhao, H., Grossman, B. H., Shay, J. W., Luo, S., Hong, W. K., Spitz, M. R. Telomere Dysfunction: a Potential Cancer Predisposition Factor. J. Natl. Cancer Institute. 95, 1211-1218 (2003). Blackburn, E. H. Walking the Walk from Genes through Telomere Maintenance to Cancer Risk. Cancer Prevention. 4, 473 (2011). Monickaraj, F., Aravind, S., Gokulakrishnan, K., Sathishkumar, C., Prabu, P., Prabu, D., Mohan, V., Balasubramanyam, M. Accelerated Aging as Evidenced by Increased Telomere Shortening and Mitochondrial DNA Depletion in Patients with Type 2 Diabetes. Molecular and Cellular Biochemistry. 365, (1-2), 343-350 (2012). Bekaert, S., De Meyer, T., Rietzschel, E. R., De Buyzere, M. L., De Bacquer, D., Langlois, M., Van Oostveldt, P. Telomere Length and Cardiovascular Risk Factors in a Middle-Aged Population Free of Overt Cardiovascular Disease. Aging Cell. 6, (5), 639-647 (2007). Weischer, M., Bojesen, S. E., Cawthon, R. M., Freiberg, J. J., Tybjaerg-Hansen, A., Nordestgaard, B. G. Short Telomere Length, Myocardial Infarction, Ischemic Heart Disease, and Early Death. 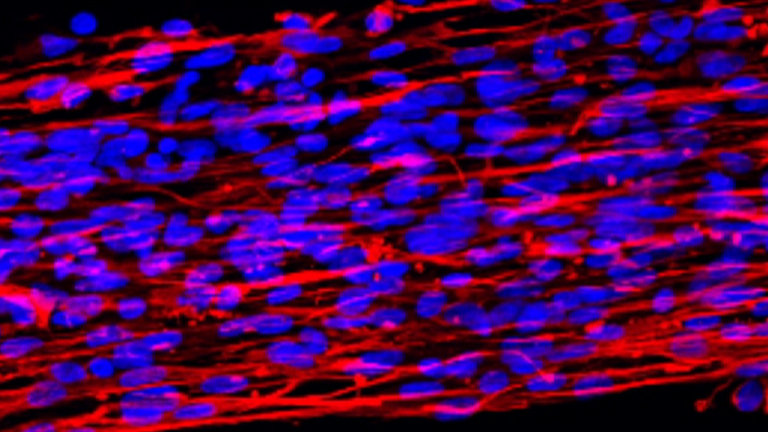 Arteriosclerosis, Thrombosis, and Vascular Biology. 32, (3), 822-829 (2011). Sun, Q., Shi, L., Prescott, J., Chiuve, S. E., Hu, F. B., et al. Healthy Lifestyle and Leukocyte Telomere Length in U.S. Women. PLoS ONE. 7, (5), e38374 (2012). Pont, A. R., Sadri, N., Hsiao, S. J., Smith, S., Schneider, R. J. mRNA Decay Factor AUF1 Maintains Normal Aging, Telomere Maintenance, and Suppression of Senescence by Activation of Telomerase Transcription. Molecular Cell. In Press (2012). Cohen, S. B., Graham, M. E., Lovrecz, G. O., Bache, N., Robinson, P. J., Reddel, R. R. Protein Composition of Catalytically Active Human Telomerase from Immortal Cells. Science. 315, (5820), 1850-1853 (2007). Atzmon, G., Cho, M., Cawthon, R. M., Budagov, T., Katz, M., Yang, X., Suh, Y., et al. Colloquium Paper: Genetic variation in human telomerase is associated with telomere length in Ashkenazi centenarians. Proceedings of the National Academy of Sciences. 107, 1710-1717 (2010). Njajou, O. T., Blackburn, E. H., Pawlikowska, L., Mangino, M., Damcott, C. M., et al. A Common Variant in the Telomerase RNA Component Is Associated with Short Telomere Length. PLoS ONE. 5, (9), e13048 (2010). Guan, W. P., Maeda, T., Makino, N. The Subtelomere of Short Telomeres is Hypermethylated in Alzheimer's Disease. Aging Disease. 3, (2), 164-170 (2012). Kimura, M., Stone, R. C., Hunt, S. C., Skurnick, J., Lu, X., Cao, X., Aviv, A., et al. Measurement of Telomere Length by the Southern Blot Analysis of Terminal Restriction Fragment Lengths. Nature Protocols. 5, (9), 1596-1607 (2010). Aubert, G., Hills, M., Lansdorp, P. M. Telomere length measurement-Caveats and a critical assessment of the available technologies and tools. Mutation Research/Fundamental and Molecular Mechanisms of Mutagenesis. 730, (1-2), 59-67 (2012). Baird, D. M., Rowson, J., Wynford-Thomas, D., Kipling, D. Extensive allelic variation and ultrashort telomeres in senescent human cells. Nature Genetics. 33, (2), 203-207 (2003). O'Sullivan, J. N., Finley, J. C., Risques, R. A., Shen, W. T., Gollahon, K. A., Rabinovitch, P. S. Quantitative Fluorescence in situ Hybridization (QFISH) of Telomere Lengths in Tissue and Cells. Current Protocols in Cytometry. Chapter 12, Unit 12.6 (2005). Baerlocher, G. M., Mak, J., Tien, T., Lansdorp, P. M. Telomere Length Measurement by Florescence in situ hybridization and Flow Cytometry: Tips and Pitfalls. Cytometry. 47, (2), 89-99 (2002). Cawthon, R. M. Telomere Measurement by Quantitative PCR. Nucleic Acids Research. 30, (10), e47 (2002). O'Callaghan, N. J., Fenech, M. A Quantitative PCR Method for Measuring Absolute Telomere Length. Biological Procedures Online. 13, (1), 3 (2011). Piatyszek, M. A., Kim, N. W., Weinrich, S. L., Hiyama, K., Hiyama, E., Wright, W. E., Shay, J. W. Detection of Telomerase Activity in Human Cells and Tumors by a Telomeric Repeat amplification protocol (TRAP). Methods in Cell Science. 17, (1), 1-15 (1995). Hochstrasser, T., Marksteiner, J., Humpel, C. Telomere Length is Age-Dependent and Reduced in Monocytes of Alzheimer Patients. Experimental Gerontology. 47, (2), 160-163 (2012). Mirabello, L., Richards, eg, Duong, L. M., Yu, K., Wang, Z., Cawthon, R., Berndt, S. I., Burdett, L., Chowdhury, S., Teshome, K., Douglass, C., Savage, S. A. Telomere Length and Variation in Telomere Biology Genes in Individuals with Osteosarcoma. International Journal of Molecular Epidemiology and Genetics. 2, (1), (2011). Shen, M., Cawthon, R., Rothman, N., Weinstein, S. J., Virtamo, J., Hosgood, H. D. 3rd, Hu, W., Lim, U., Albanes, D., Lan, Q. A Prospective Study of Telomere Length Measured by Monochrome Multiplex Quantitative PCR and Risk of Lung Cancer. Lung Cancer. 73, (2), 133-137 (2011). Capezzone, M., Cantara, S., Marchisotta, S., Filetti, S., De Santi, M. M., Rossi, B., Pacini, F., et al. Short Telomeres, Telomerase Reverse Transcriptase Gene Amplification, and Increased Telomerase Activity in the Blood of Familial Papillary Thyroid Cancer Patients. Journal of Clinical Endocrinology & Metabolism. 93, (10), 3950-3957 (2008). Insel, K. C., Merkle, C. J., Hsiao, C. P., Vidrine, A. N., Montgomery, D. W. Biomarkers for Cognitive Aging Part I: Telomere Length, Blood Pressure and Cognition Among Individuals with Hypertension. Biological Research for Nursing. 14, (2), 124-132 (2012). Aviv, A. Telomeres and Human Somatic Fitness. Journals of Gerontology Series A. 61, (8), 871-873 (2006). Yaffe, K., Lindquist, K., Kluse, M., Cawthon, R., Harris, T., Hsueh, W. C., Simonsick, E. M., Kuller, L., Li, R., Ayonayon, H. N., Rubin, S. M., Cummings, S. R. Telomere Length and Cognitive Function in Community-Dwelling Elders: Findings from the Health ABC Study. Neurobiological Aging. 32, (11), 1055-1060 (2011). O'Donovan, A., Pantell, M. S., Puterman, E., Dhabhar, F. S., Blackburn, E. H., et al. Cumulative Inflammatory Load Is Associated with Short Leukocyte Telomere Length in the Health, Aging and Body Composition Study. PLoS ONE. 6, (5), e19687 (2011). Parks, C. G., DeRoo, L. A., Miller, D. B., McCanlies, E. C., Cawthon, R. M., Sandler, D. P. Employment and Work Schedule are related to Telomere Length in Women. Occupational Environmental Medicine. 68, (8), 582-589 (2011). Epel, E. S., Blackburn, E. H., Lin, J., Dhabhar, F. S., Adler, N. E., Morrow, J. D., Cawthon, R. Accelerated Telomere Shortening in Response to Life Stress. PNAS. 101, (49), 17312-17315 (2004). Uchino, B. N., Cawthon, R. M., Smith, T. W., Light, K. C., McKenzie, J., Carlisle, M., Gunn, H., Birmingham, W., Bowen, K. Social Relationships and Health: Is Feeling Positive, Negative, or Both (Ambivalent) about your Social Ties Related to Telomeres? Health Psychology. In Press (2012). Xu, Q., Parks, C. G., DeRoo, L. A., Cawthon, R. M., Sandler, D. P., Chen, H. Multivitamin Use and Telomere Length in Women. The American Journal of Clinical Nutrition. 89, (6), 1857-1863 (2009). Wan, S., Hann, H. W., Myers, R. E., Fu, X., Hann, R. S., Kim, S. H., Tang, H., Xing, J., Yang, H. Telomere Length in Circulating Serum DNA as a Novel Non-Invasive Biomarker for Cirrhosis: a Nested Case-Control Analysis. Liver International. In Press (2012). Immonen, I., Seitsonen, S., Saionmaa, O., Fyhrquist, F. Leucocyte Telomere Length in Age-Related Macular Degeneration. Acta Ophthalmologica. In Press (2012). Lan, Q., Cawthon, R., Shen, W., Weinstein, S. J., Virtamo, J., Lim, U., Hosgood, H. S. 3rd, Albanes, D., Rothman, N. A prospective study of telomere length measured by monochrome multiplex quantitative PCR risk of non-Hodgkin lymphoma. Clinical Cancer Research. 15, 7429-7433 (2009). Balasbramanyam, M., Adaikalakoteswari, A., Sameermahmood, Z., Mohan, V. Biomarkers of oxidative stress: methods and measures of oxidative DNA damage (COMET assay) and telomere shortening. Methods Molecular Biology. 610, (3), 245-261 (2010). Maser, R. S., DePinho, R. A. Telomeres and the DNA damage response: why the fox is guarding the henhouse. DNA Repair (Amsterdam). 3, (8-9), 979-998 (2004). Njajou, O. T., Hsueh, W. -C., Blackburn, E. H., Newman, A. B., Wu, S. -H., Li, R., Simonsick, E. M., Harris, T. M., Cummings, S. R., Cawthon, R. M. Association between telomere length, specific causes of death, and years of healthy life in health, aging, and body composition, a population-based cohort study. The Journals of Gerontology Series A: Biological Sciences and Medical Sciences. 64A. 8, (8), 860-864 (2009). Mather, K. A., Jorm, A. F., Milburn, P. J., Tan, X., Easteal, S., Christensen, H. No Associations Between Telomere Length and Age-Sensitive Indicators of Physical Function in Mid and Later Life. The Journals of Gerontology Series A: Biological Sciences and Medical Sciences. 65A, (8), 792-799 (2010). Riethman, H., Ambrosini, A., Castaneda, C., Finklestein, J., Hu, X. -L., Mununuri, U., Paul, S., Wei, J. Mapping and Initial Analysis of Human Subtelomeric Sequence Assemblies. Genome Research. 14, 18-28 (2003). Terry, D. F., Nolan, V. G., Anderson, S. L., Perls, T. T., Cawthon, R. Association of Longer Telomeres with Better Health in Centenarians. J. Gerontol. A. Biol. Sci. Med. Sci. 63, (8), 809-812 (2008). Zee, R., Castonguay, A. J., Barton, N. S., Buring, J. E. Mean Telomere Length and Risk of Incident Colorectal Carcinoma. A Prospective, Nested Case-Control Approach. Cancer Epidemiology Biomarkers & Prevention. 18, (8), 2280-2282 (2009). Njajou, O. T., Hsueh, W. -C., Blackburn, E. H., Newman, A. B., Wu, S. -H., Li, R., Simonsick, E. M., Harris, T. M., Cummings, S. R., Cawthon, R. M. Association Between Telomere Length, Specific Causes of Death, and Years of Healthy Life in Health, Aging, and Body Composition, a Population-Based Cohort Study. The Journals of Gerontology Series A: Biological Sciences and Medical Sciences. 64A, (8), 860-864 (2009).